Join the #Me&Mom Online Contest and Win a Spa Package for Your Mom! She’s got the gentlest touch that reassures you when you need it most. She has that sweet smile that makes your day so much brighter. She has the voice that could either lull you to deep sleep or send chills down your spine (when you’ve done something wrong). She gave birth to you, raised you, and never stopped loving you since day one. She’s your mom and she’s the best woman in your life. 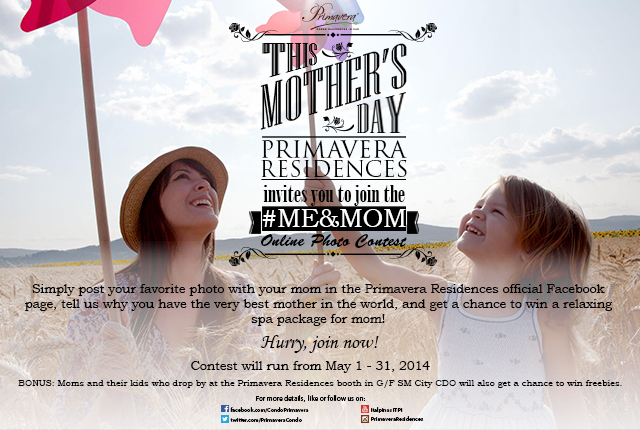 This mother’s day, Primavera Residences honors moms everywhere with the #Me&Mom online contest. Simply post a photo of you and your mother in the official Primavera Residences Facebook page and tell us why you have the very best mom in the whole world. One chosen entry will win a relaxing spa package for his/her mother courtesy of Primavera Residences. 1. The entries must be posted in the official Facebook page of Primavera Residences (see this link: www.facebook.com/CondoPrimavera) and not in any other Primavera Facebook pages. Only the entries posted in the official page will be counted. 3. Judging will be based on the following: 50% — judges’ votes, and 50% — public vote. So share your entries via Facebook and tell you friends to like and share! 4. Contest will run for the entire month of May. The winning entry will be announced on June 2. 5. An additional prize will be raffled off to moms and kids who will drop by and take photos at the Primavera Residences booth in SM City CDO. To qualify for the additional prize, use the hashtag #me&mom and include Primavera Residences SM booth in the post location. 6. The prize (special spa package) will be claimed at Cagayan de Oro City, so the participants’ moms must be CDO-based. Primavera Residences is a mixed-use green property in Cagayan de Oro offering residential, commercial and office spaces. It recently won in the Asia Pacific regional competition of the prestigious International Property Awards for best mixed-use development in the Philippines. To know more about Primavera Residences, go HERE.